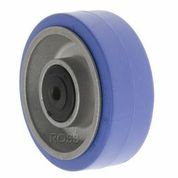 Medium duty rubber wheels, either as black rubber wheels, non marking grey rubber wheels, or non marking elastic rubber blue wheels used on flight cases. For a temperature resistant option, our phenolic resin wheels are ideal for hot environments, such as bakeries and ovens. The majority of our rubber wheels are available as either plain bore or as roller bearing wheels.